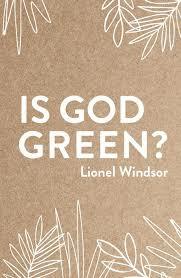 Lionel Windsor’s Is God Green? is the place to start for anyone who wants a Christian view on the environment. At 71 pages in length it doesn’t say everything, but it says the most important things. Christians must surely not believe anything less than what Lionel lays out in this excellent book. The environment has become a major concern in recent years. Human beings are having an extraordinary and often very negative impact on our natural environment. Unfortunately this is often a highly contentious issue with links to political and economic agendas. I appreciated the way that Lionel avoided unnecessary contention throughout this book whilst emphasising the things that the Bible emphasises. This is the kind of book that Christians with very different environmental, political, and economic views will be able to find a lot of common ground in. The book is structured according to the Bible’s story-line of creation, fall, redemption, and new creation. I appreciated the way in which this made the book’s message both unsurprising (for those who know their Bibles) and yet full of surprising insights into how very relevant the Bible is to contemporary environmental concerns. This also means that this is an excellent book to give to any non-Christian who is concerned about the environment and is willing to consider a Christian perspective on the issue. It basically just explains the gospel (through the lens of the environment) and calls on people to respond rightly to Jesus. Lionel understands well that the only environmental view that a Christian ought to promote is one that flows out of the gospel, and is not in tension with it. This book also nips particular ‘trendy’ theological ideas in the bud quickly and effectively. I was particularly pleased at Lionel’s insistence that it is God who will renew the world, not us (p.60) and that our ‘labour in the Lord’ is telling others the gospel in view of the coming judgement (p.63-4). I would also be very interested if the author would risk possibly being contentious elsewhere by offering further reflections on environmental issues and what he believes a suitable Christian response ought to look like. A blog series perhaps? All in all, this is a highly valuable book. I hope that it starts some conversations among Christians about the ways in which our personal decisions impact the world that God has given us. You should read it.